Ellen Gibson sent this one in: "This is a picture of the Crossmen color guard on finals night this summer. 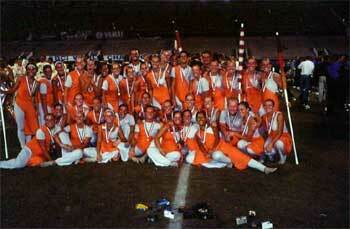 I came to march Crossmen from the UK and had the best summer ever, although it was certainly hard work. We had a truly international guard with three British members, 1 Dutch member and 1 German member. There was also a British baritone player and a Dutch snare player. So I'd say that we really put the "I" in "DCI" this year." Thanks Ellen!